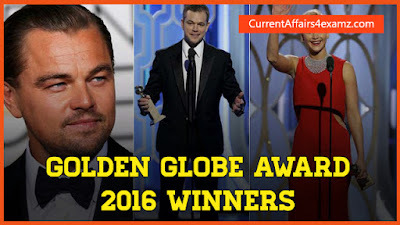 Hi Aspirants..The 73rd Golden Globe Awards 2016 honored the best in film and American television of 2015 and was held on 10 January 2016. The Golden Globe Award is an American accolade bestowed by the 93 members of the Hollywood Foreign Press Association (HFPA) recognizing excellence in film and television, both domestic and foreign. Here’s the complete list of winners of Golden Globes 2016. You can download the PDF list from the below link. Supporting Actor, Series, Limited Series or TV Movie: Christian Slater, “Mr. Robot.